Shortly after midnight on May 7th, 2010 a YouTube video filmed on opening night of Iron Man 2 of the teaser trailer for Super 8 was found and posted around the web. A couple of days before Iron Man 2 was released, a description of a supposed "leaked trailer" hit Super 8 related sites. The description was mostly accurate, supporting the claim that the trailer was in fact leaked. On May 11th, 2010 the HD version of the teaser trailer is uploaded to apple.com. This enabled a much more thorough analysis of the trailer and many more discoveries were made. A quick rearrangment of the frames revealed the phrase "Scariest Thing I Ever Saw"
Near the end of the trailer, a super 8 camera lens can be seen. 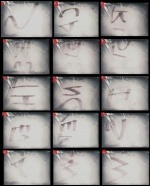 Inside the lens, several letters can be seen moving past in a movie reel fashion. By analyizing each frame, the letters S C A R I E S T T H I N G I E V E R S A W can be seen. Analysis of the letters quickly let to the discovery of the website Scariestthingieversaw.com; the first viral website in the Super 8 Experience/ARG. 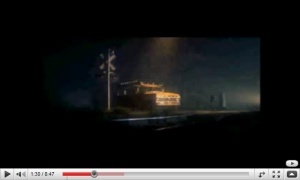 In the teaser trailer, a speeding pickup truck can be seen crashing through a railroad crossing guard, drive onto train tracks and then crash head-on with a locomotive, causing a massive derailment. 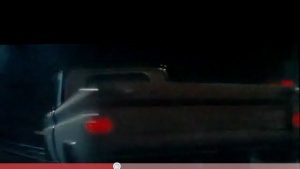 A comparison has been made to the yellow truck driven by Roy Neary in the Stephen Spielberg movie Close Encounters of the Third Kind and the yellow/brown pickup truck seen in the teaser trailer for Super 8. In an interview with JJ Abrams, he said that he wanted to pay homage to the Stephen Spielberg movies that he grew up watching. The similarities to the yellow pickup trucks could be pure coincidence or perhaps Abrams paying homage to one of his heroes and the Producer of Super 8. 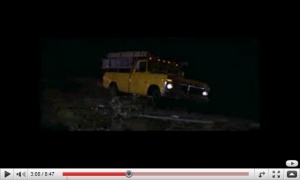 The images above are screen captures of the yellow truck from Super 8. In the teaser trailer, a cargo train can be seen traveling through a rural area of the country. The text and audio in the teaser trailer tell us that the train was en route from Area 51 in Nevada to Wright-Patterson AFB in Ohio. “Copy Groom Lake One, expect your..."
Side of a cargo compartment with USAF logo and the word "BONHAM"
At least one of the cargo compartments of the train has a USAF logo painted on it. To the left of the USAF logo, the word "BONHAM" can be seen towards the end of the teaser. When the pickup collides with the train, it causes a huge derailment. The cargo compartments begin colliding with one another and then fly into the air, knocking over power lines and spilling their content onto the ground. When the dust settles, the camera pans to the wreckage on the ground and zooms in on a cargo compartment with a USAF logo where something is trying to escape. A few pieces of the wreckage contain possible clues and have helped confirm the time and setting of the derailment. Seen among the wreckage was a crate with a designation AN/TTQ-1 (Army Navy / Transportationable Tracing Equipment). The units inside the crate were used during WWII for plotting the flights of aircraft, aiding in air defense. Two old computer terminals can also be seen in the rubble. They appear to be TRS-80 Model III computers. The computer models are debated, however since the date of release for the Model III is July, 1980. It pushes the suspected time frame of the derailment incident into mid-1980 where as previously it was speculated to occur in 1979 or early-1980. A protruding twisted train rail can be seen in the right hand side of the scene with what appears to be spray painted markings. Upon analysis, the markings appear to be i21 + 70.64. It was originally thought that this was a fallen utility pole used as a milepost marker along railways to indicated the distance past the nearest mile marker and a clue as to the location of the accident. In this case, the marker would be located 70.64 feet beyond mile post number 21 along an unknown rail line. Further analysis of the scene shows that there are in fact missing rails on the rail ties and tie plates just below the protruding twisted rail disproving the mile marker theory. Unfortunately the painted markings remain a mystery. In the upper right there's a beam with painted writing on it, but is hard to make out.